The first Brothers of the Holy Family arrived in Spain from France in the year 1909. The support of the Mambrilla-Prado family in La Horra (Burgos) permitted the Brothers Martin Dumas and Gerasime Christoud forming the first Community and opening a formation house. From 1909 to 1933, the small Communities of Spain were directly dependant of the General Council. The majority of the new Spanish Brothers were sent to work in the schools of America. In 1933 it was created the European Province, which comprised the Communities of France, Italy and Spain. 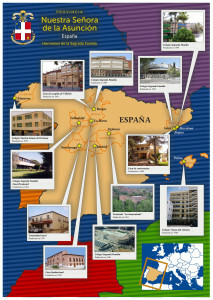 The growth of the Brothers in the Spanish Communities led to form in 1947 the Vice-Province “Our Lady of the Assumption” which comprised the houses of the Congregation in Spain. At that moment, there were four Communities: The formation houses of La Horra and Sotillo de la Ribera (in the Burgos District) and the schools of Madrid and Valladolid. In 1951 it was erected the Province Our Lady of the Assumption as an autonomous jurisdiction formed by the Communities of Spain. The growth of the number of Brothers in the decades of the 50s and 60s made possible the creation of the schools in Madrid, Barcelona, Burgos and Gavà (Barcelona), and the formation houses of Valladolid, Sigüenza and Salamanca. It also kept the sending of a large number of Brothers to the works that the Congregation had in Uruguay and Argentina. The sensitivity of the decade of the 70s to be nearer to underprivileged realities led to the opening of Communities in El Pozo del Tío Raimundo (Madrid), Santa Juliana (Madrid), Llobregós (Barcelona), Finisterre (La Coruña); Brasilia, the new capital of Brazil; Colombia, though later on it passed to Lago Agrio (Ecuador) and Navaluenga (in the Gredos mountain, Ávila). The crisis of vocations was strongly noted in the decade of the 80s and the work was focused in the established works. 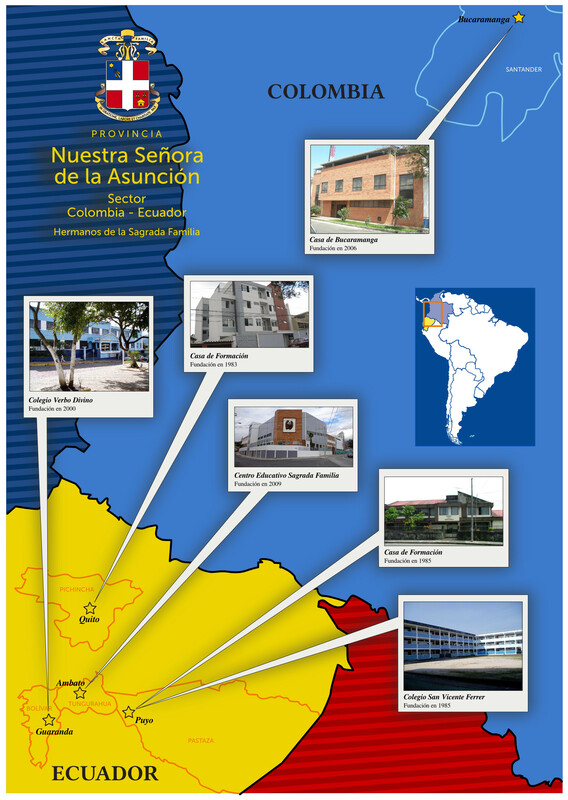 Despite all, the Province took charge of some schools of other institutions in Puyo and Guaranda (Ecuador) and Palma de Mallorca (Spain), and opened the formation houses of Puyo and Quito (Ecuador), Begues (Barcelona) and Villalón (Burgos). The last years of the decade of the 80s and the decade of the 90s and 2000, the work was focused in the shared mission, making responsible the lay people in the educational and pastoral tasks from the identity and the Educational Project of the Congregation. In 1993 it was created the Association Nazarene Fraternities, inviting the lay people to participate also of the spirituality of the Institute. In 2003, it was created a new Community in Madurai (India) and in 2006 another new Community in Bucaramanga (Colombia). 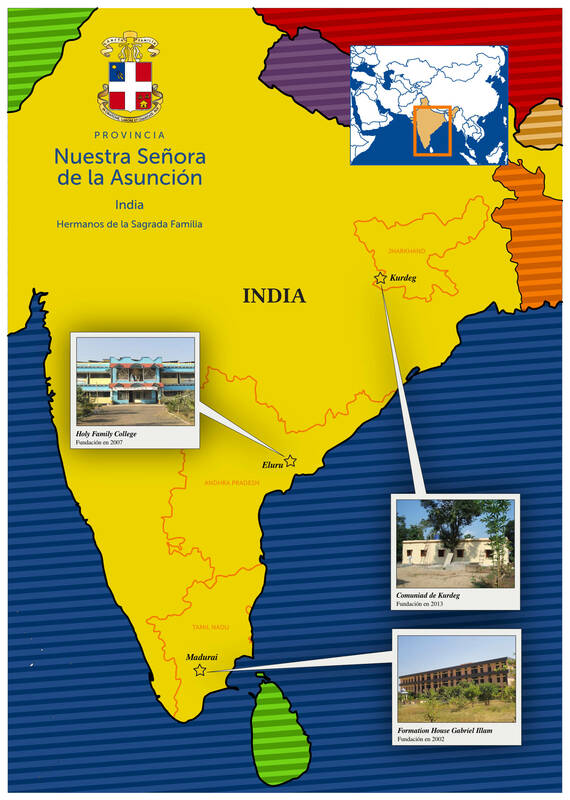 In the last years, while in Spain the entrance of new Brothers is diminishing, in India, the growth of vocations of Brothers has permitted opening Communities in Eluru and Kurdeg. The closure of the Community of Lago Agrio (Ecuador), which directed a big school, has been compensated by the opening of a new school in the city of Ambato, with the desire of maintain the educational commitment in Ecuador. The apostolic work is carried out in the Christian education and the school and parish pastoral, which cares for some 10,000 students. The Communities that live in the rural ambience collaborate with the parishes in the liturgical animation, the teaching of Religion, the catechesis, etc. * La Horra (Burgos) Founded in 1909 Foundational House. For long time formation house and school; today Community inserted in parish activities. Museum and house for group activities. 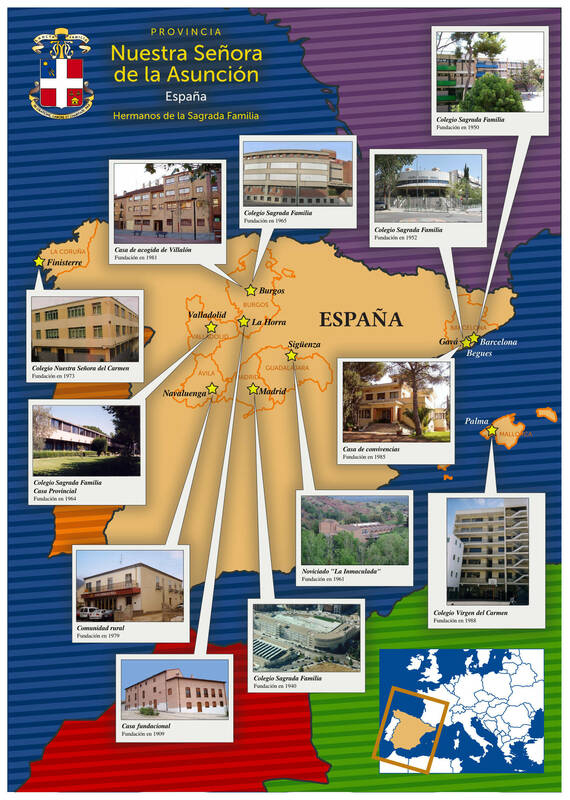 * Madrid: Founded in 1940 “School Holy Family”. Kindergarten up to Higher Secondary School Education. Pastoral activities. Delegation of the NGO Carumanda. * Barcelona: Founded in 1950 “School Holy Family”. Kindergarten up to Higher Secondary School Education. Pastoral activities. Delegation of the NGO Carumanda. * Gavá(Barcelona) Founded in 1952 “School Holy Family”. Kindergarten up to Higher Secondary School Education. Pastoral activities. Delegation of the NGO Carumanda. * Valladolid : Founded in 1964 Provincial House. “Boarding School Holy Family”. Secondary Education. Pastoral activities. Delegation of the NGO Carumanda. Meetings and group activities. * Burgos Founded in 1965 “School Holy Family”. Kindergarten up to Higher Secondary School Education. Pastoral activities. Delegation of the NGO Carumanda. Youth Centre. * Burgos -Villalón Founded in 1992 Formation House (Scholasticate) and welcoming house for youth in vocational discernment. Headquarters of the NGO Carumanda. * Sigüenza (Guadalajara) Founded in 1960 Novitiate “The Immaculate”. Nazareth House. Welcoming of Groups. * Finisterre (A Coruña) Founded in 1974 Parish School “School Our Lady of Carmel” (Association of Board). Kindergarten, Primary and Secondary Education. Parish Activities. * Navaluenga (Avila) Founded in 1979 Parish Pastoral. Teaching Religion in Government Schools..
* Begues(Barcelona) Founded in 1985 House for Groups activities. * Palma de Mallorca: Founded in 1988 “School Virgin of Carmel” (Carmelite Fathers). “School Holy Family”. Kindergarten up to Higher Secondary School Education. Pastoral activities. Delegation of the NGO Carumanda. * Quito Founded in 1992 Formation House. Pastoral Activities. * Puyo Founded in 1985 Diocesan School “St Vincent Ferrer” and Formation House. Kindergarten up to Higher Secondary School Education. Pastoral activities. Activities of solidarity. * Guaranda Founded in 2000 Diocesan School “Divine Work”. Kindergarten up to Higher Secondary School Education. Pastoral activities. Activities of solidarity. * Ambato Founded in 2009 “School Holy Family”. Kindergarten, Primary and Secondary Education. Pastoral Activities. “Nazareth Centre”. Meetings and group activities. * Madurai Founded in 2003 Formation House. Scholasticate. Vocation promotion activities. Pastoral activities. * Eluru Founded in 2007 Formation House. Novitiate, Postulancy. Vocation promotion activities. Pastoral activities. * Kurdeg Founded in 2013 Diocesan School. Primary and Secondary Education. Vocation promotion activities. Pastoral Activities. * Bucaramanga Founded in 2006 House of Vocation promotion. Pastoral Activities.